These are signs that don't fit the mold of typical signs built such as Channel Letters or a Pole Sign. Usually these signs are more architectural and require more time and material to produce. At Tri City Sign we strive to set you apart from your competition. Let us help you design and fabricate your ideas for something that will stand out from the crowd! 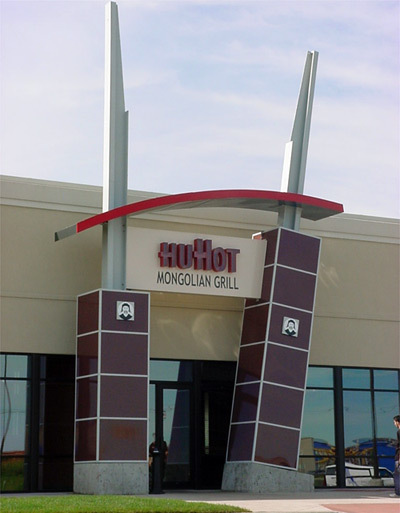 HuHot Mongolian Grill was looking to stand out from the strip mall it was located at. Instead of simply installing Channel Letters on the fascia, Tri City Sign Company designed and constructed a new entrance sign display. The sign has two chopsticks, walking between them creates an entrance to the restaurant. The chopsticks are constructed from pre-finished aluminum and the logos illuminate at night. The band between the chopsticks has "HuHot" Exposed Neon Channel Letters. The "Mongolian Grill" letters are routed in the aluminum band.